Six-time Pro Bowl wideout Chad Johnson had quite the career catching passes for the Cincinnati Bengals. 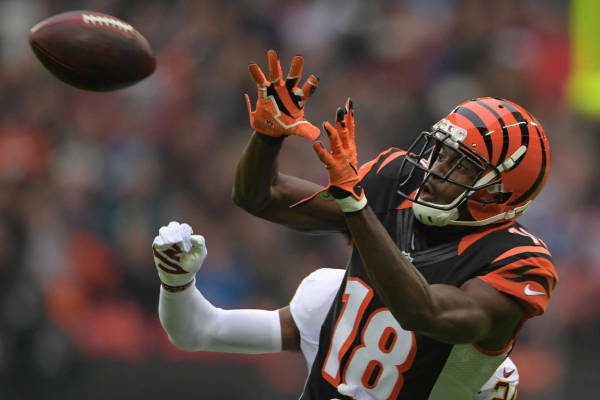 But he’s more than happy to step aside and make room for current Bengals star receiver AJ Green in the pantheon. In an interview with Geoff Hobson of the Bengals’ official website on Tuesday, Johnson had high praise for Green. “To me he’s the greatest (Bengals receiver) of all time because he can do things I wasn’t able to do,” Johnson said. The Artist Formerly Known As Ochocinco was a standout in his 10-year career with Cincinnati, recording 751 receptions for 10,783 yards and 66 touchdowns in a Bengals uniform. Meanwhile, the 28-year-old Green is only in his sixth season with the team but has already logged 474 catches for 7,067 yards and 48 touchdowns and counting.